Aweber and MailChimp are two popular email services used by hundreds and thousands of professional bloggers across the world. Earlier, I've compiled a popular list of MailChimp plugins available for WordPress blogs. Today, we're going to look at some of the excellent solutions for seamlessly integrating Aweber subscription forms within your WordPress powered site. More than half of these plugins can be used for other popular list building services as well. Through these plugins, apart from embedding a regular email subscription form, you can also create custom popup subscription forms for your email list. I'd strongly recommend trying out different locations for the subscription forms to get the best results. You can even integrate more than two subscription forms for different list building services. Aweber Forms - If you want to create nicely formatted Aweber subscription forms within minutes, this plugin is an ideal choice for you. General users can easily integrate these forms through a shortcode almost anywhere within their blog design. Various other form placement options like a link, inline and exit event form trigger are also supported by this plugin. You can easily customize various sections of the subscription form to match it with your site design. The premium version of this plugin offers plenty of options to create a highly customized subscription form. Simple Aweber Integration - This is one of the most flexible Aweber form plugins that can be easily integrated within posts and pages with a click of a button. Users can easily embed it either before the post content or at the end of the post body. Through shortcode, you can blend the subscription form with almost any custom section on the blog. Display prioritization can also be configured if you're embedding multiple forms in different locations. Custom horizontal and vertical form styling is also included in the plugin to gel it well within the available space. MailMunch - The email subscription forms integrated through this plugin are loaded asynchronously to ensure the web page loads smoothly without any latency. Customizable themes ensure you can get started with a custom design with minimum hassle. You can also target specific posts, pages, and categories so that your email form only appears on select pages. Integrated A/B testing facility helps you find out the best performing Aweber subscription forms. You can also view the associated analytics data to know better about how the visitors are interacting. Kolakube Email Forms - This simple yet powerful is one of the easiest Aweber form integration solution for WordPress bloggers. Absolutely no coding is required to use this plugin's functions. It intelligently picks the active theme styling rules to render the embedded form style in the best possible way so that it closely matches with the site design. There is no restriction on the number of subscription forms that can be added through this plugin. The quick 2-step form configuration method is quite easy and even layman can use it to add email forms to his blog or website. Plugmatter Optin Feature Box - This is a unique plugin that adds a large full width custom Aweber opt-in feature box right below the header of your blog or website. Such feature boxes are well known to give excellent results when it comes to building an email list. Through handy ready-made templates, you can easily create impressive opt-in feature boxes on your WordPress powered website. The available customization options for each feature box are dead simple and let you experiment with different design variations without any need for complex custom coding. Magic Action Box - This useful plugin can add both custom subscription form and a custom opt-in feature box on a WordPress blog with ease. It has built-in options for embedding email forms at targeted locations within a blog theme. You can also customize the forms as per your requirements. One can also use the ready-made custom styles to quickly apply to the existing subscription forms. You can also create custom subscription forms just for the home page of your blog. The premium version of this plugin gives you several awesome features to get more out of Aweber forms. 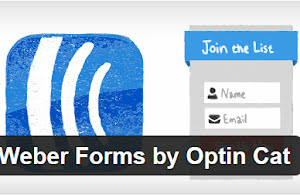 Optin Revolution - If you prefer popup email subscription forms, this plugin is a good option to integrate such forms. Bloggers can easily make custom sections within the popup form to try out different schemes and marketing pitches. New users can take advantage of the video tutorials to easily learn how to take advantage of all the features of the plugin. The premium version of the plugin not only lets you customize every aspect of the subscription form but collects statistics and analytics data related to the form. You can also easily change the custom call to action buttons. WP Subscribe - It is one of my favorites Aweber subscription form plugin that is quite powerful and easy-to-use. The email form is completely responsive and allows you to freely change the text to match your needs. Power users can easily customize it with additional CSS styling. It also plays nice with popular caching and SEO plugins to ensure forms are gelled with your site. It can be easily embedded inside any widgetized area within your theme. Apart from Aweber, you can also use it to power other popular email subscription services viz., Feedburner & MailChimp. FormCraft Add-Ons - If you're using FormCraft plugin to create forms on your site, you can use this powerful extension to integrate Aweber subscription forms with ease. All you have to supply the API key associated with your account and you're ready to integrate a custom lead generation web-form within your WordPress website. If you already have some custom forms on your website, you can easily add the email subscription field within them through this plugin. I've used it for a couple of my clients and got a very positive feedback about the features of this extension. PopupAlly - As the name suggests, this useful plugin allows you to easily add custom Aweber subscription forms in the form of a popup. Instant preview and user-friendly customization options ensure one can easily design different types of popup subscriptions forms without any coding skills. Its detailed step by step tutorials is quite popular among new users helping them easily utilize the full features of this excellent plugin. You can also get the lightbox effect for your popups if required. You can also configure the email popup's behavior on the close action by the visitor.